Hi guys! Another Christmas manicure from me this week. Today I thought I would go for something a bit darker. 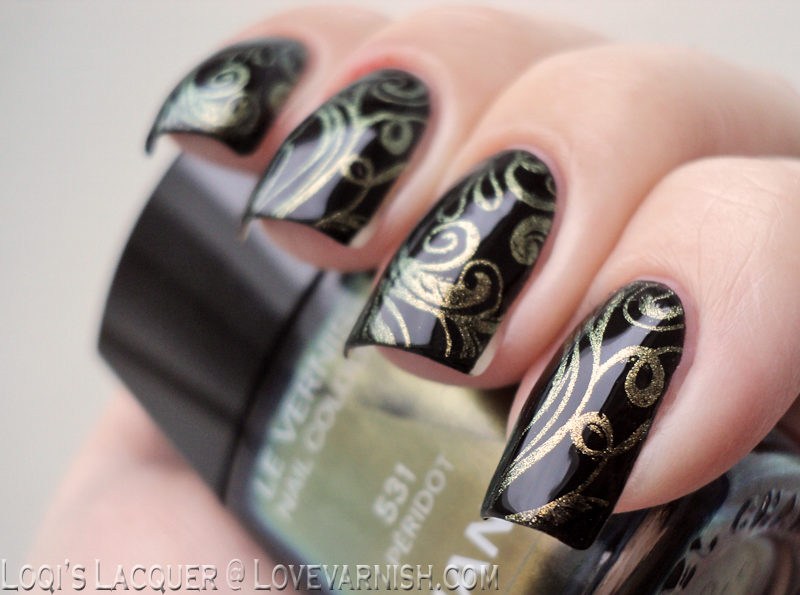 I love chic black holiday wear with accents, so why not make a manicure like that as well? For this manicure I started out with a nice and shiny base of Wet 'n Wild Black Crème. I then picked one of my older Moyou plates (Princess 13) and used Chanel Peridot to stamp the lovely curly pattern. I love stamping with Peridot, since you can still see the lovely green duochrome in the gold which gives it just a little something extra. 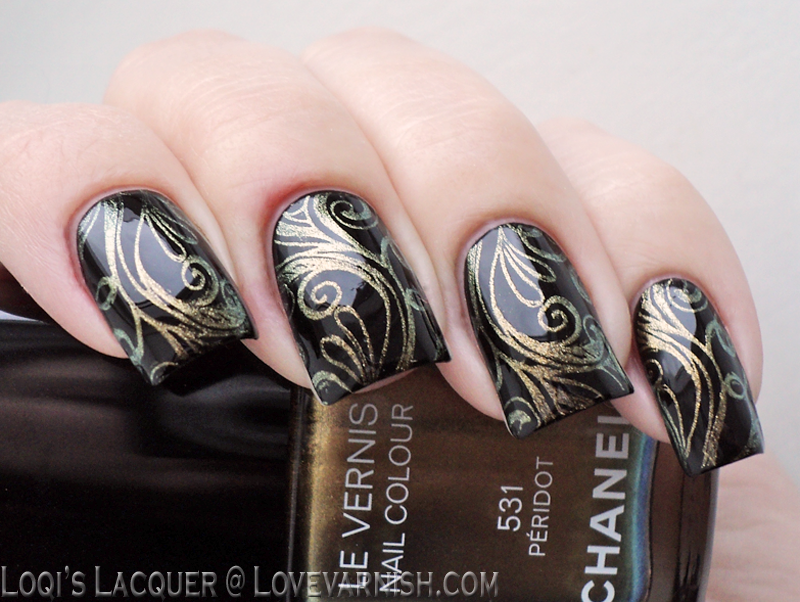 Such a beautiful design and the stamping is so precise! You're amazing! These are absolutely amazing. So elegant! Gah, this is so vampy and delicious! I lurve it!! Merry holidays to you as well, Deborah! Very sophisticated! A nice change from holiday red & green! I love this! The black makes the peridot just POP! This is so unbelievably stunning! 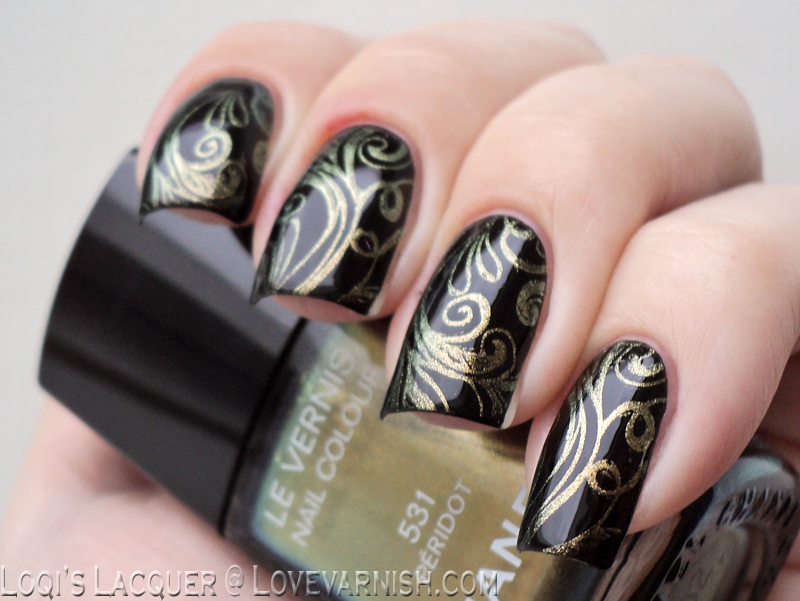 The dramatic juxtaposition of the gold design to the black ground is so elegant and gorgeous! Just a hint, every Monday there's another awesome girl blogging ;-). Gorgeous! I love this kind of mani too - so classy and vampy! Beautiful mani!! Black and gold looks absolutely perfect together! Beautiful work, I love these colors together! The stamping is perfect on these! Beautiful design! Beautiful! 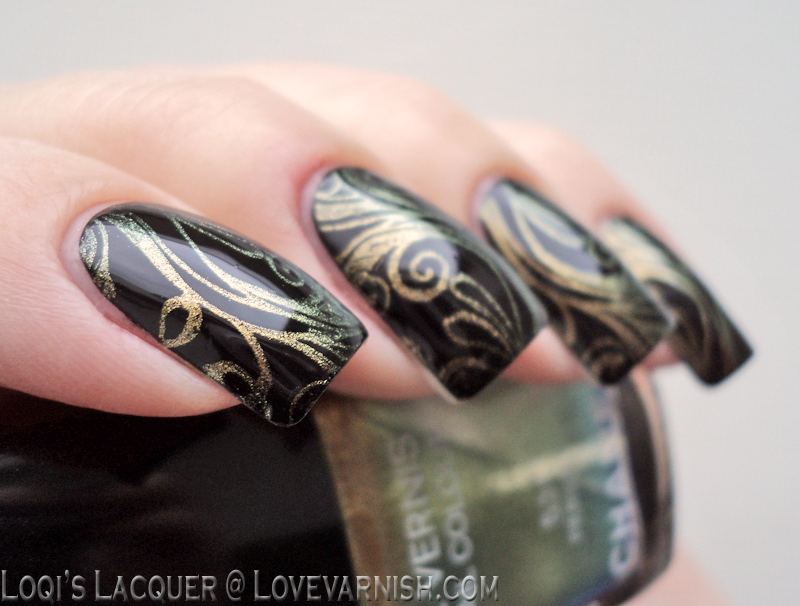 I love the stamping on this! This is such a sophisticated mani for Christmas! Stamping with duochromes is so much fun! Love this elegant version! This is gorgeous!! I love the stamping! :D glad you like it Jamie! Yes! It makes it so much stronger! Thank you! I was so happy with how it turned out!